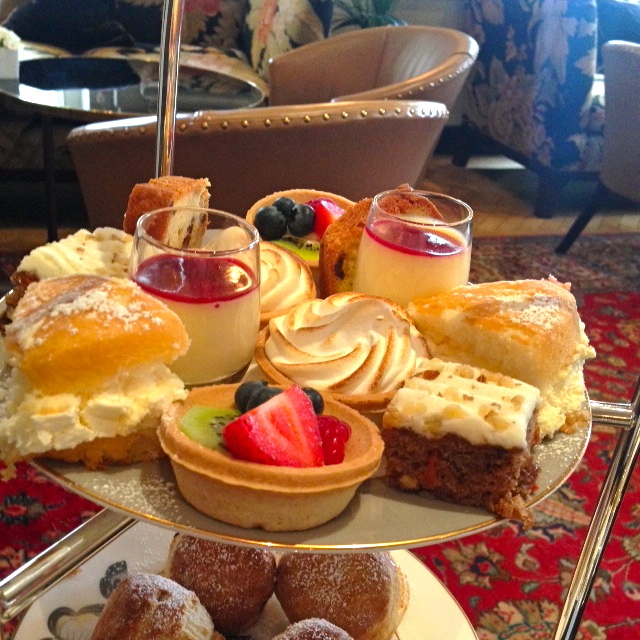 I’ve said before how much I love Afternoon Tea, but this time I think I’ve found one of the best in London. 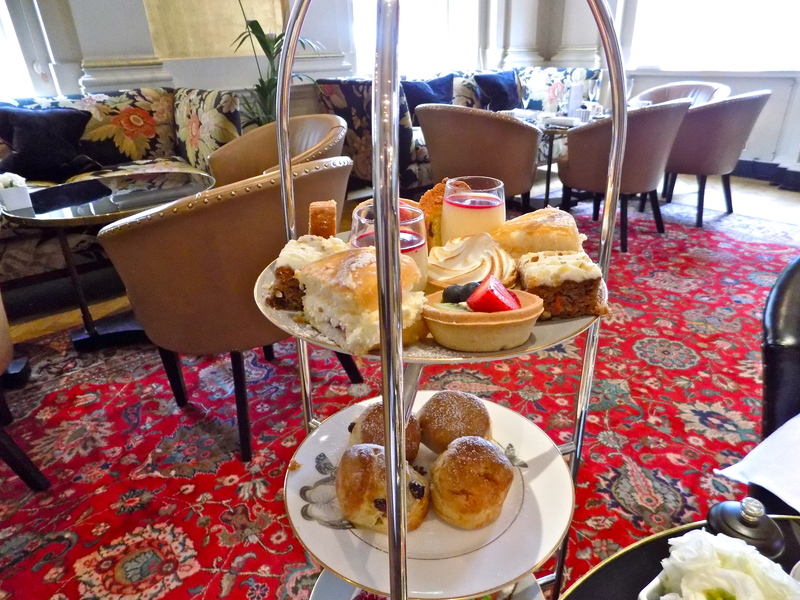 A couple of weeks ago, Wayne’s Mum and I decided we would indulge in a little afternoon tea (justified by the frivolous spending on football and rugby tickets that is a regular occurrence in both of our households!) 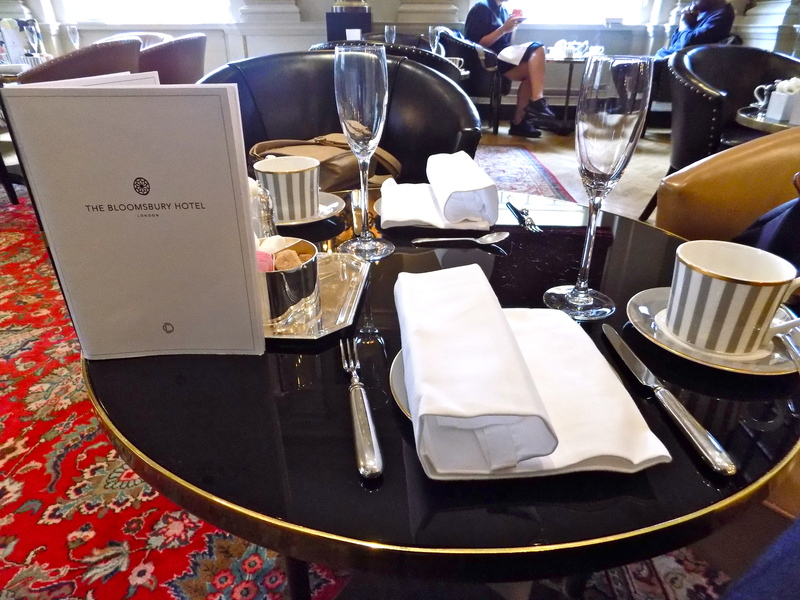 and after a quick scan on Afternoontea.co.uk, I booked The Bloomsbury Hotel. 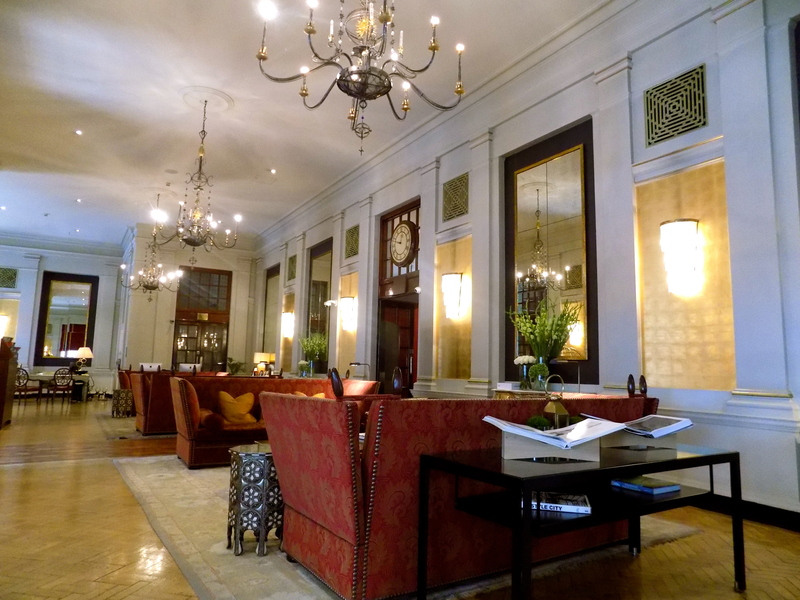 Nestled in pretty Bloomsbury, a stones throw from The British Museum, sits The Bloomsbury Hotel. As part of the Doyle Collection (The Marleybone, The Kensington etc) I knew it would be good. We had to navigate our way around the roadworks taking place right outside, but as soon as we had stepped through those doors and into the grand foyer it felt as though we had left the rest of London behind. 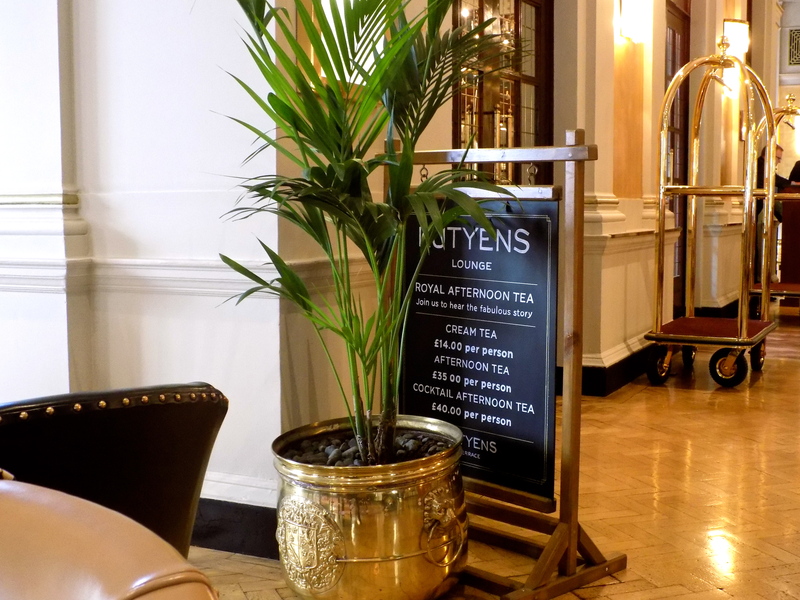 We were ushered inside by the loveliest waitress, shown to our beautifully set out table in the Lutyens Lounge, and promptly handed tea menus. First things first, can we just take a moment to appreciate the table? 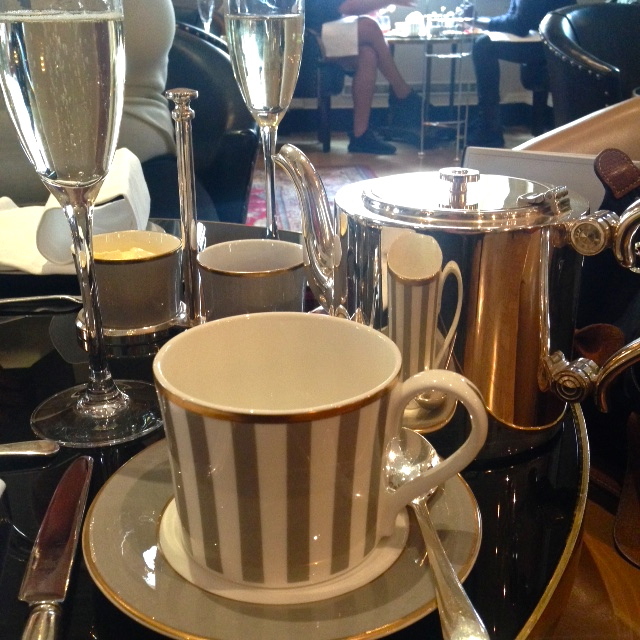 I instantly fell in love with the stripy grey and gold teacups and everything just seemed to sparkle. We ran with the theme and ordered Prosecco, before delving into the tea menu. The staff were so knowledgeable about the tea on offer and bent over backwards to ensure we were ordering tea that we would enjoy, giving us detailed descriptions and letting us smell various teas before making our decisions. Lin ordered a green tea with honey and I opted for the White Moon; a fragrant, floral, white tea that was perfectly refreshing. 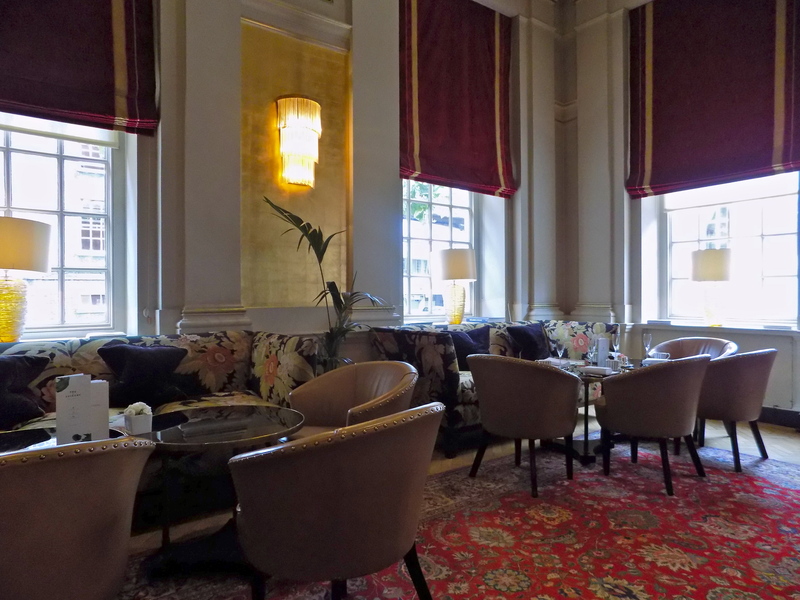 The room was truly beautiful, and although tucked into the corner of the hotel foyer, the lounge felt secluded and cosy. I loved the fact that we could people watch as all sorts of interesting people came in and out of the hotel’s doors. Our attention was drawn back to the event in hand when we were presented with the most impressive tea stand I have ever seen. The presentation was flawless and everything looked delicious. We couldn’t wait to get stuck in! We started with the sandwiches. 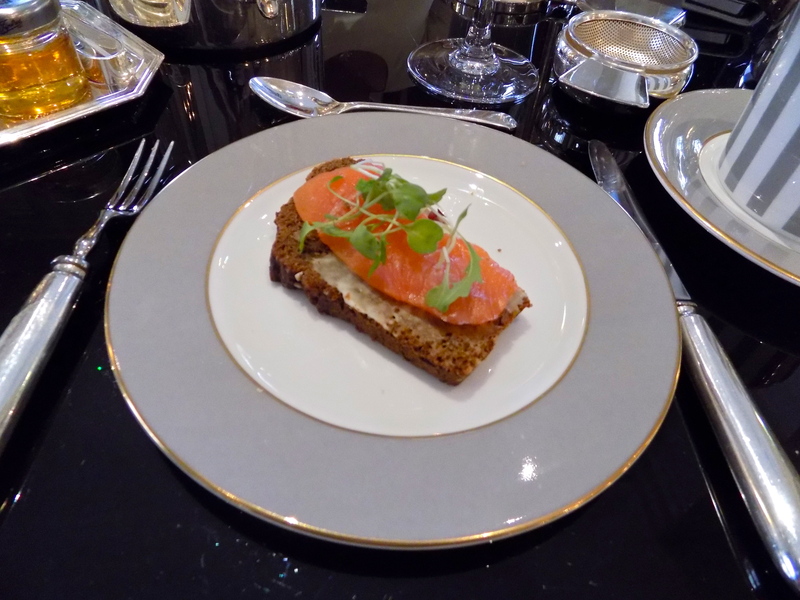 Egg mayonnaise and cress on malt bread, pastrami with Dijon mayonnaise on onion bread, cream cheese, chive and cucumber on white bread and finally smoked salmon and crème fraiche on Guinness bread. They were all amazingly fresh and delicious in their own way, but surprisingly the winner for us was the pastrami sandwich. The saltiness of the meat worked so well with the mustard mayonnaise and the added flavour of bread made the simple combination much more exciting. 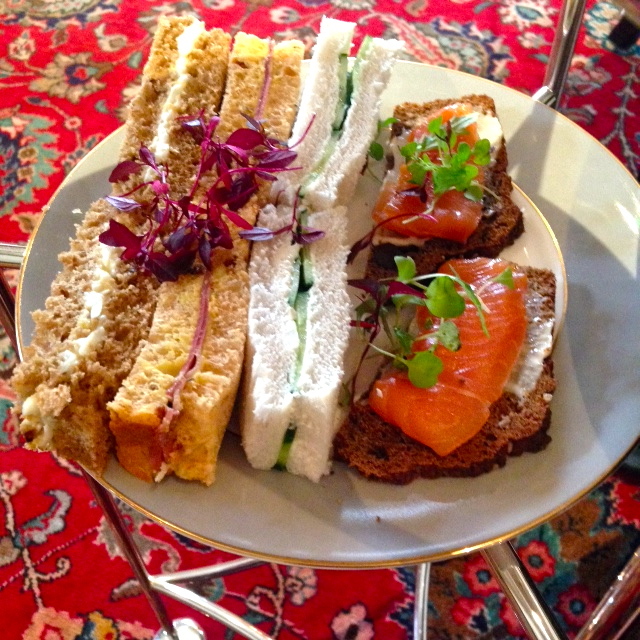 The smoked salmon on Guinness bread also stood out for me and it was refreshing to experience a different take on the traditional afternoon tea sandwich fillings. 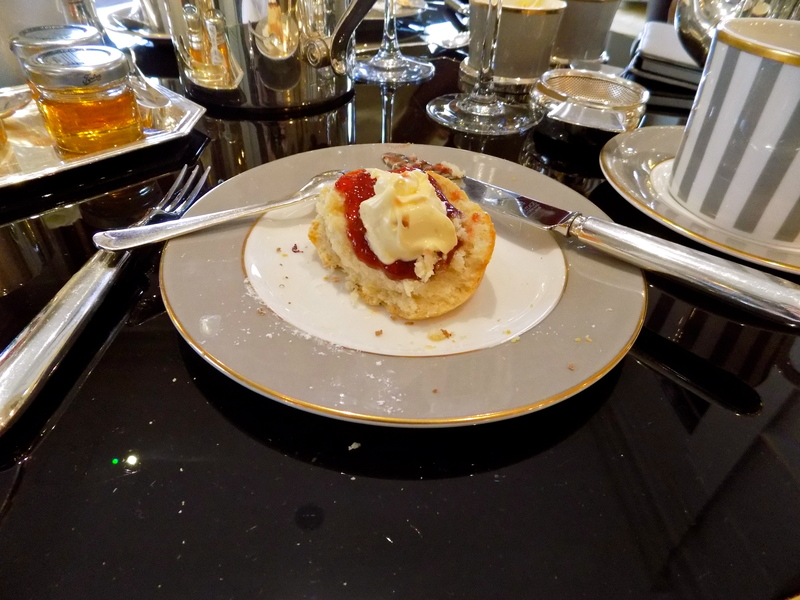 Sandwiches were swiftly followed by scones; both plain and raisin, heaped with sweet strawberry jam and Devonshire clotted cream. 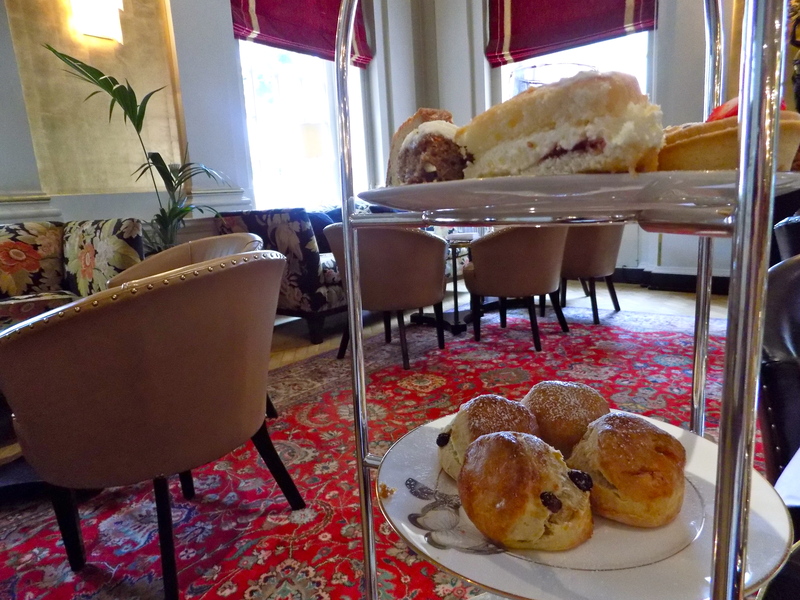 Being from the West Country we are fairly fussy about our scones, but these fluffy, warm creations certainly passed the test. There were SO many, and they all looked almost too beautiful to touch. Having to admit that we probably wouldn’t be able to manage them all, we started with our favourites. Not only was the food flawless and the surroundings perfect, but the staff were just amazing. They were friendly, funny and made us feel completely at home. 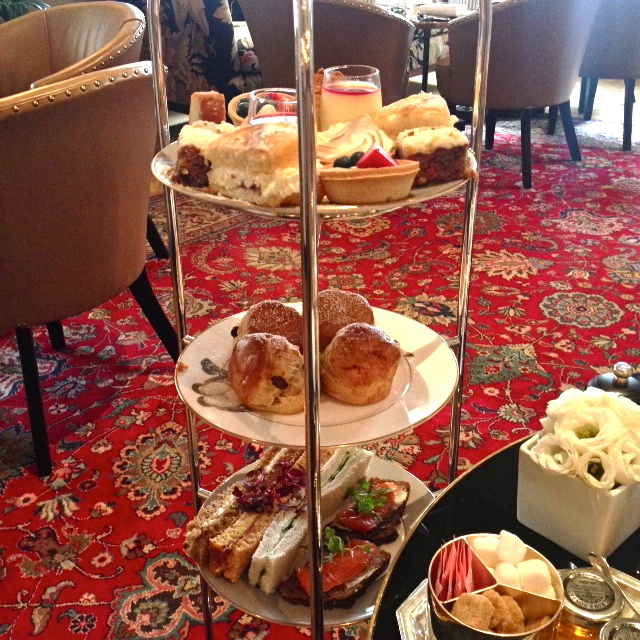 I wouldn’t hesitate in recommending The Bloomsbury to anyone looking for the perfect afternoon tea spot in London. I’m already trying to think of an excuse to go back!